Over the weekend, an event for Hyperdimension Neptunia: The Animation ended after a man allegedly stormed the theater stage, wielding a weapon and reportedly demanding to see one of the anime's voice actresses. The event, held on Saturday in Tokyo's Ikebukuro, premiered the first two episodes of upcoming Hyperdimension Neptunia animated program, which is based on the series of video games. The event featured cast members, such as voice talent Rie Tanaka. The incident was tweeted out in real time, with early reports saying the man was carrying a crowbar (some called it a "blunt weapon"). According to Twitter user @Aozaki_n, the man had a scarf covering his mouth and took to the stage during a cast talk session. Everyone on stage fled, according to Twitter users (via Yaraon!) the man screamed, "There's a criminal among us!" and "Get Rie Tanaka out here!" MSN, however, reported that the suspect was talking "nonsense". The police were called and soon arrived on the scene, where they took the 30-something year-old man into custody and discovered he was carrying a knife. 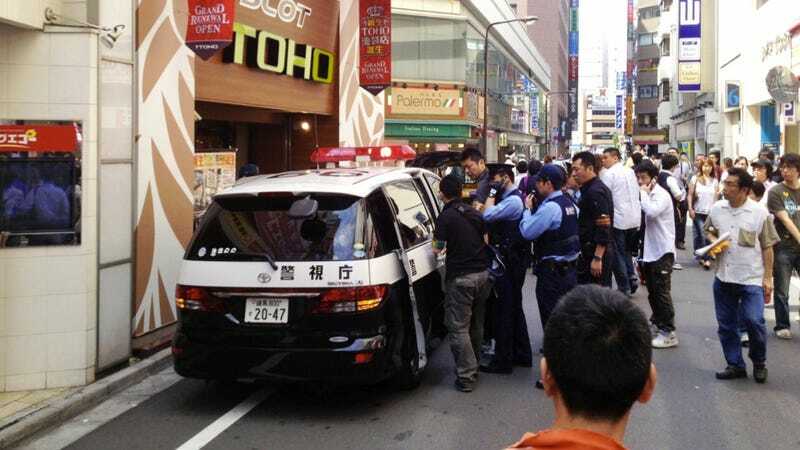 According to Sponichi, the suspect has since been charged with violating the country's strict Firearms And Swords Control Law. Tanaka's talent agency released a statement saying that the voice actress suffered minor injuries when fleeing the stage. Understandably, her management added that more than anything, Tanaka was dealing with significant mental trauma after the ordeal. Rie Tanaka is one of Japan's most popular voice actresses. Previously, she appeared on hug pillows and trading cards, and she also released cosplay photo books. Last year, she got married and ended her fanclub. There's speculation online in Japan that the weekend's bizarre and frightening incident could be related to that decision.